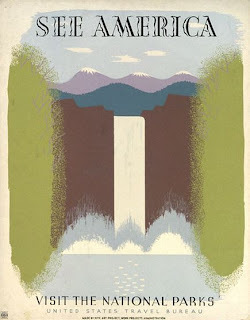 The graphic designer and backpacker sides of me were delighted to come across a series of vintage U.S. Park Posters on National Geographic's website. I particularily enjoy the combination of straight vertical lines traveling through this poster with the wave-like font of "See America." Ah, design. I think they need one for Michigan's breathtaking Pictured Rocks National Park.Ooo, could that be a new project? Meanwhile, on the Anne Boleyn gown front, I went to the craft store at lunch today, discovering a treasure trove of on-sale beading trinkets perfect for the neckline. I'm thrilled beyond belief. I will be taking pictures of the progress and posting a detailed update soon.